The Lost Vape Orion DNA Go Starter Kit is the modern advancement of vaping technology, integrating Evolv's advanced DNA Go chip within an exquisitely machined chassis in a compact, pod-size structure for a spectacular masterpiece! The Lost Vape Orion is constructed with attention-to-details machining, manifesting a highly durable alloy shell with beautiful real carbon fiber or Abalone details to create a truly luxurious all-in-one, or AIO,pod system.The Lost Vape Orion is powered by Evolv's customizable DNA Go chipset, maintaining the fully sophisticated customizable adjustments, power regulations, and precise output modes Evolv have come to known for. 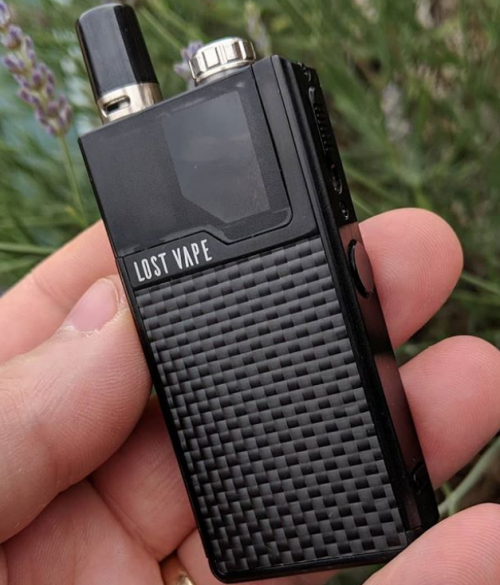 Managed by a responsive bottom adjustment button with corresponding LED lights, the Lost Vape Orion has three standard output: Low (White Light), Medium (Blue Light), and High (Red Light). An additional function is added to the device, Replay Functionality, allowing users to precisely save the most recent desired output for future firing level. Internally, the Lost Vape Orion 40W features an internal 950mAh rechargeable battery with a discreet microUSB port located at the bottom of the device. Ovde mi Replay vec ima smisla - mali i jednostavan pod (na stranu sad izgled ili velicina ovog konkretnog uredjaja,mislim uopste na taj tip),bez puno dugmica i povratnih informacija ali sa mogucnoscu da pruzi ujednacen rad. Stranica je napravljena za 0.082 sekundi sa 36 upita.